In a complex healthcare environments, people and equipment are constantly in motion. So, what’s the best way to keep track of patients, equipment, nurses and doctors as they move from room to room and throughout the facility? How can technology be leveraged to improve the efficiency of healthcare delivery, reduce costs and increase patient satisfaction? In each of these situations, Real Time Location Systems or RTLS can have a role. RTLS implementations started to show up in hospital environments starting in 2011 and 2012. Despite the proven successes of the early adopters, it has been estimated that only 20 percent of healthcare facilities currently use the technology. However, recent advancements in RTLS technology and developments in cloud-based solutions will allow more facilities to implement the RTLS systems in the future. Next generation RTLS is going to transform hospital operations in many different ways and now is the time to get up to speed with this technology. Since there are competing forms of RTLS with different tracking and location services for each, knowing which technology is best for different solutions or use cases is critical. Vantage has been on the forefront of designing and implementing RTLS across many different healthcare design projects and have extensively analyzed how technology will impact the future of healthcare delivery. In this post, we share what we have learned about RTLS, how it works and its associated technologies, and present recommended uses and benefits for implementing RTLS solutions. RTLS is a location system used to automatically identify and track the location of objects or people in real time, usually within a building or other contained area. Most systems consist of wireless tags or badges that emit signals, and readers that receive those signals and track the location of where the tag is or has been. Triangulating the signal from the tag to the readers identifies the location of the tag within the facility. How Can RTLS Technologies Be Used in a Hospital? See our blog post on How Healthcare Organizations Are Planning for the Integration of IoT Technologies for more RTLS use cases. RTLS can be broken down into two technologies – passive and active – which are defined by the types of tracking tags that are used. Passive RTLS uses Passive Tags to hold information that can be gathered by physically scanning the information from the tag. The scanning infrastructure can range from a handheld RFID scanner to a large network of hard-wired scanners in strategic locations (typically doorways, portals and other chokepoints) across a facility. Passive systems are most effectively used for tracking tags passing through a specific chokepoint. An example being the infamous sensors found on clothing in a retail clothing store, with the chokepoint being the two panels flanking each entrance into the facility. Passive systems are used primarily for directionality and thresholds. Newer technologies allow the panels to be hidden in walls, ceilings, shelves, and other spaces to reduce the architectural impact of the system. Passive RTLS has most successfully been implemented for specimen/sample tracking, medication tracking, supplies/linens tracking, [typically small] equipment tracking, and in some limited cases wayfinding. Some companies are experimenting with passive RTLS for patient tracking, but nothing safe and reliable has been commercially released to our knowledge to date. We believe that Passive RTLS is currently considered a bleeding edge technology, but manufacturers claim that it may be worth considering as a future direction for smaller items with Chain-Of-Custody, cost, or inventory management concerns. Active RTLS uses Active Tags to hold and push information from the tag and the environment. An active RTLS infrastructure typically consists of a network of building devices with regular communication with its active tags through a specific signal frequency. The current leading active RTLS platforms typically have their own specialized approach or specialized mixture of signal frequencies. What Wireless Technologies are Used for RTLS? Radio Frequency (RF) is typically the most economical active RTLS signal frequency. The system’s building infrastructure for Radio Frequency typically requires less devices, however the typical complaint for this type of signal frequency is that it does not inherently detect walls, floors, ceilings, curtains or dividers, which can make vital features like Room Level Accuracy challenging or impossible to consistently achieve. Wi-Fi is arguably the most popular of the Radio Frequencies used in RTLS, due to its multipurpose nature. The systems that take advantage of Wi-Fi typically use a facility’s existing Wi-Fi network and hence do not need an additional RTLS infrastructure. 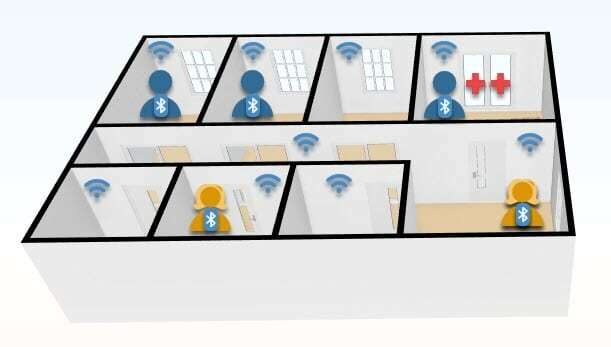 However, the layout and configuration needs of the Wi-Fi network may conflict with the RTLS’s requirement to accurately locate devices within the facility; for instance, a RTLS Wi-Fi layout tends to be significantly denser than a typical design and the Wireless Access Point (WAP) layouts need to alternate locations by floor to help the system distinguish between floors. Accordingly, although a facility may be able to take advantage of its existing Wi-Fi network within a building to support RTLS, the RTLS design will be dependent on verifying the layout of the existing WAPs and determining whether they can support the system’s needs which typically involves surveys, additional access points, and adjustment of existing access point locations. Other frequencies outside of the standard Wi-Fi frequencies can be used for building-wide locating. Separate frequencies can prevent the RTLS from overloading the wireless network of the facility and can extend the battery life of the RTLS tags. We believe that modern medical grade networks should be designed to provide sufficient bandwidth that this not be a problem. Wi-Fi systems require signal frequency devices and associated cabling to be installed within the building separate from the Wi-Fi access points needed within the building. These devices need to be carefully coordinated with WAPs and other ceiling-mounted access points (such as Telemetry and DAS) within the building, as they may cause interference with each other. Our position is that these types of RTLS should only be installed in facilities that need or mandate a separate network from the Wi-Fi network, due to the additional signal frequency devices needed, and the additional coordination needed to reduce interference. Bluetooth Low Energy (BLE) is typically misunderstood within the RTLS industry. BLE is a Radio Frequency, and thus susceptible to the same shortcomings suffered by the other Radio Frequency signals. Due to its reduced power, BLE signals are more easily blocked by walls, floors and ceilings, and the current generation of systems is still not capable of providing 100% Room Level Accuracy. BLE is becoming increasingly common in the RTLS industry to supplement other signal types for things such as wayfinding and room level accuracy. Global Positioning System (GPS) in a campus or multi campus setting, uses global positioning system satellites to track assets, vehicles, etc. between campuses. The accuracy of GPS tracking, as experienced with most car navigation systems, depends on the areas being tracked, specifically satellite coverage and visibility. GPS is not currently widely implemented through healthcare but knowing the proximity and location of incoming equipment/supplies or the estimated arrival time (ETA) of an incoming trauma patient, could support multiple use cases and support the optimization of workflows. Ultrasound is a lower frequency used in RTLS that cannot pass easily through walls or floors. This allows Ultrasound to have a high degree of room level accuracy. InfraRed (IR) is another of the lower frequency systems used in RTLS. IR provides room level accuracy but, being less powerful, has issues associated with functioning only in a ‘line-of-sight’ capacity. For example, if a heavy blanket is covering an IR tag, the system may not see the tag due to the blanket blocking the line-of-sight from tag to sensor. What the Main Types of Hardware Used for RTLS? Hardwired hardware is typically Power over Ethernet (POE) compatible and has the benefit of not adding the operational cost of regular battery changing and potentially not adding to the load on a legacy wireless network. On the other hand, hardwired hardware within existing facilities can be expensive to implement due to the potential need to run additional cables. Battery powered hardware will incur an additional operational cost to regularly change out batteries, but typically allows for straight-forward installation into existing facilities. Battery powered hardware may be an additional load on a legacy wireless network if it communicates over the wireless network. What are the Key Benefits of RTLS in Healthcare Environments? Minimizing wait times – RTLS allows care teams to track patient traffic and efficiently send patients to different parts of the facilities to get the correct care. One example of a hospital using RTLS to automate patient flow was able to increase utilization of the facilities operating rooms by 23%. Not only did patients have a better experience, but RTLS contributed to increasing profits. Protecting patients – Nurses can ensure that patients stay in designated areas and not wander or get lost. RTLS can make sure that patients are where they should be and will notify medical personnel if someone is in an undesignated area. Increasing staff efficiency – With the potential for integration with other clinical, information and building systems, RTLS has the potential to automate many low value tasks currently performed by operational and clinical staff and simplify or automate them. This will allow more time spent on patient care. Improving communication – Communications between patients and care team and within the care team – Patients can use automated systems to request amenities and have them delivered in a shorter time. Within the care team, nurses and doctors can have better records of patient activity and care. Reducing equipment misplacement – The care team can know exactly where crash carts, defibrillators, wheelchairs, etc., are located. One hospital reduced its rate of lost or stolen devices from over 14% to zero with an RTLS solution. RTLS implementations are going to explode in the very near future and you will need to be smarter about investing in new technology. Whether you are upgrading or renovating the technology in an existing facility or planning to build a new healthcare facility, now is the time to start exploring your options for implementing RTLS.